Definition at line 24 of file CLGraphicalPrimitive1D.h. Definition at line 24 of file CLGraphicalPrimitive1D.cpp. Definition at line 34 of file CLGraphicalPrimitive1D.cpp. Adds the attributes for a graphical primitive 1D object to the passed in. object. Definition at line 189 of file CLGraphicalPrimitive1D.cpp. 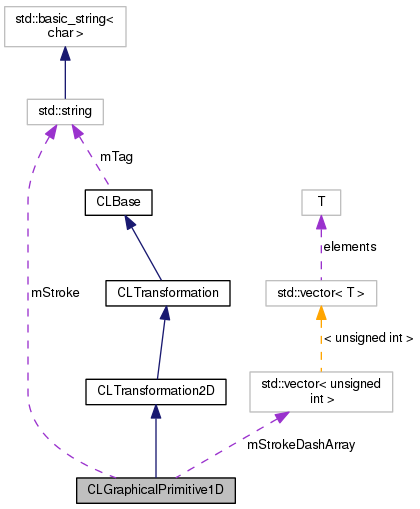 References CLTransformation2D::addSBMLAttributes(), mStroke, mStrokeDashArray, and mStrokeWidth. 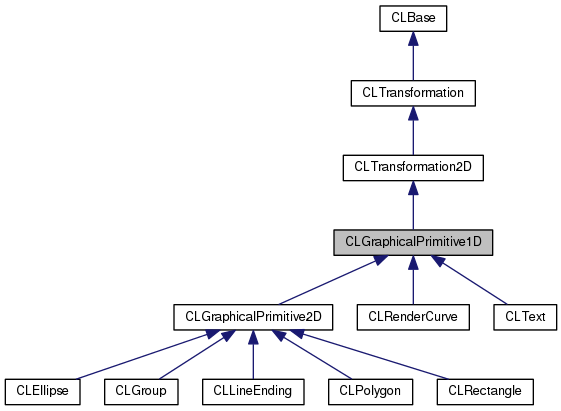 Referenced by CLGraphicalPrimitive2D::addSBMLAttributes(), CLRenderCurve::toSBML(), and CLText::toSBML(). Definition at line 85 of file CLGraphicalPrimitive1D.cpp. Referenced by CLLayoutRenderer::extract_1d_attributes(), getPen(), CCopasiXML::save1DAttributes(), and CLLayoutRenderer::update_textures_and_colors(). Definition at line 69 of file CLGraphicalPrimitive1D.cpp. Referenced by CQRenderConverter::applyStyle(), CLLayoutRenderer::extract_1d_attributes(), fillItemFromText(), getPen(), CCopasiXML::save1DAttributes(), and CLLayoutRenderer::update_textures_and_colors(). Definition at line 77 of file CLGraphicalPrimitive1D.cpp. Referenced by CLLayoutRenderer::extract_1d_attributes(), getPen(), and CCopasiXML::save1DAttributes(). Returns true is the dash array has been set or false otherwise. Definition at line 109 of file CLGraphicalPrimitive1D.cpp. Returns true is the stroke has been set or false otherwise. Definition at line 101 of file CLGraphicalPrimitive1D.cpp. Referenced by CQRenderConverter::applyStyle(), CCopasiXMLParser::GroupElement::end(), CLLayoutRenderer::extract_1d_attributes(), fillItemFromText(), getPen(), CCopasiXML::save1DAttributes(), and CLLayoutRenderer::update_textures_and_colors(). Returns true is the stroke width has been set or false otherwise. Definition at line 93 of file CLGraphicalPrimitive1D.cpp. Referenced by CCopasiXMLParser::GroupElement::end(), CLLayoutRenderer::extract_1d_attributes(), getPen(), and CCopasiXML::save1DAttributes(). Definition at line 121 of file CLGraphicalPrimitive1D.cpp. Referenced by CCopasiXMLParser::RectangleElement::start(), CCopasiXMLParser::EllipseElement::start(), CCopasiXMLParser::TextElement::start(), CCopasiXMLParser::RenderCurveElement::start(), CCopasiXMLParser::PolygonElement::start(), and CCopasiXMLParser::GroupElement::start(). Definition at line 61 of file CLGraphicalPrimitive1D.cpp. Definition at line 45 of file CLGraphicalPrimitive1D.cpp. Referenced by CCopasiXMLParser::GroupElement::end(), CCopasiXMLParser::RectangleElement::start(), CCopasiXMLParser::EllipseElement::start(), CCopasiXMLParser::TextElement::start(), CCopasiXMLParser::RenderCurveElement::start(), CCopasiXMLParser::PolygonElement::start(), and CCopasiXMLParser::GroupElement::start(). Definition at line 53 of file CLGraphicalPrimitive1D.cpp. Definition at line 27 of file CLGraphicalPrimitive1D.h. Referenced by addSBMLAttributes(), getStroke(), isSetStroke(), and setStroke(). Definition at line 29 of file CLGraphicalPrimitive1D.h. Referenced by addSBMLAttributes(), getDashArray(), isSetDashArray(), parseDashArray(), and setDashArray(). Definition at line 28 of file CLGraphicalPrimitive1D.h. Referenced by addSBMLAttributes(), getStrokeWidth(), isSetStrokeWidth(), and setStrokeWidth().